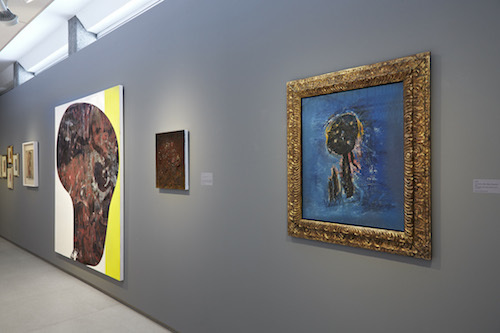 View of “The Matter That Surrounds Us: Wols and Charline von Heyl,” 2014. Curated by Katy Siegel as the first of three exhibitions to focus on artists who eschew the academic binary of abstraction and figuration, “The Matter That Surrounds Us” pairs Wols (born Alfred Otto Wolfgang Schulze) and Charline von Heyl. That von Heyl would be an exemplary case in this model of aesthetic tropism is perhaps unsurprising, given her willful avoidance of a signature style. In the course of their becoming material, her garish, high-key, color-filled compositions might tend toward the biomorphic, even the representational, in producing a face or corporeal form, or might instead exist as a field of nonobjective relationships. Irrespectively, von Heyl’s canvases propose that recognition need not be a precondition for knowing, and anyway, that categories exist relatively, on a continuum. Interspersed amidst small, achingly lovely and gnomic works by Wols, in an intimate installation in a low-ceilinged, gray-washed, subterranean gallerySiegel took her cues for the spotlights, dark walls, and close hang from the 1945 and ’47 Drouin exhibitions of Wols in Parisvon Heyl’s comparatively massive canvases strikingly gain in immediacy. As Wols’s diminutive and highly ornate watercolor and inks demand a form of attention at near range, the show prompts a closer look at von Heyl’s modes of effecting paradoxical spaces, as well as the textures of her surfaces, from which such depths both recede and project in elaborately staged optical non sequiturs. Continuities between the two artists’ approaches to picturing preclude a curatorial recourse to simple formal analogues among specific works, and the hang is stronger for its avoidance of both didacticism and literal one-to-one comparisons. Still, an intergenerational connection is very much the point. Wols’s Blue Phantom, 1951, on view here, is the first oil painting that made a strong impact on von Heyl (she recalls seeing it as a child in Cologne’s Ludwig Museum). An apparition, it foreshadows von Heyl’s Medusas and apotropaic pictures. Wols inhabited a near alchemical and imperfectly sublimatory practice, whereby art was wrested from the baseness of a liminal life. This seems far from von Heyl, for whom such biographical circumstances (to say nothing of conceptual strategies) are anathema. But the present context made me think that the refusal of an intended image might in both cases register the experiential as its very substance.